My secret weapon in feeling full of life… A capsule full of goodness. I was introduced Juice Plus over a year ago. A close friend started on the products and I was watching her flourish, I had not prioritised the expense and kept putting it off. Then I fell pregnant, as I was progressing through my third pregnancy I felt more and more drained. I was feeling grumpy with the kids most the time and getting out of bed was such an effort, despite being a morning person. Not fun. I got to the point where I knew something had to be done. I was already taking pregnancy vitamins, iron and vitamin C but still feeling rubbish. So I thought I would give Juice Plus a try. One of the ladies that I heard about Juice Plus from, spoke about her success with her autoimmune condition. 10 years ago I was diagnosed with an autoimmune condition affecting my blood platelets and my body’s ability to clot as well as my energy levels. Over the years I have learnt how diet can impact greatly on autoimmune conditions and general well-being. Even with the best eating habits over the last 4 years I haven’t seen much of a change to my platelets and energy levels. Within 3 weeks of taking the Juice Plus capsules my platelets increased by 18, which is significant and went to 98 (only been this high once or twice ever in my history of testing). After 3 months I began to realise all the gradual changes that had been occurring. I was waking up and getting out of bed straight away, I was joking and playing with the kids more and generally feeling pretty good. I was doing more and more as my pregnancy progressed because I was full of energy. I had a quick recovery from the birth and even with broken nights sleep every night, I had zero brain fog. The results are awesome considering it is just fruit and vegetables. There is a growing gap in between what our body needs and what we get, given our fast paced, high stress society and mediocre quality of fresh produce. Then there’s Juice Plus: A wholefood, plant based supplement with absolutely no nasties that has a variety of over 30 different fruits and veggies everyday! Unlike synthetic supplements the body recognises all of the ingredients in the capsules and can there fore easily absorb all the nutrients effectively. Now as a breastfeeding mumma I am able to supplement my diet with ‘Complete’ – a whole food, plant based, shake mix. This gives me the iron and nutrients I need to keep my body fuelled and ready for action as a mum of 3. The process in which the ingredients are encapsulated is what really sold me. It has now become part of my passion to share these products with others so they can feel the amazing benefits too. Just as the results from the capsules took me by surprise, so did the community I became part of. Women supporting women, with a focus on personal growth, connecting with and helping others to become their best. Being surrounded by like minded people has been so inspiring and keeps me on track with my purpose and passion. For more information on the products check out the Juice Plus page or get in touch. Well it’ been over a year since my last blog!! 😱 I thought I would have restarted a month or two after Oleena was born but with building a house, doing the bookwork for my husbands electrical business, training in Educational Kinesiology and raising two small kids, it just didn’t happen. The blog started as a way for me to share what I have learnt about the digestive health. It actually made me accountable in those final few (and most important) weeks of my pregnancy with Oleena. I continued with a dairy, sugar and gluten free diet for the first few months of Oleenas life with me breastfeeding and this all seemed to have paid off. I introduced new foods into my diet while breastfeeding and Oleena had no adverse reactions. Then when introducing foods to her, I chose to hold off on gluten and dairy until after 6 months when I believe her stomach was strong enough, and sure enough she didn’t have any reactions- only some minor changes in her diaper which is totally normal when they are processing new foods. It could have been the diet, delaying introduction or different genetic make-up (or it could be all the factors combined) that has resulted in Oleena having significantly better food tolerance than Finlay. As mentioned something else I have been up to over the last year is training in Educational Kinesiology ‘Brain Gym®’. Researching into natural healing, being a teacher and graduate of Sport Science, Brain Gym® has been a very natural progression and combines all my passions together. Now that I am a qualified Brain Gym® Consultant I am turning my passion into a business and can work one on one or small group sessions helping both children and adults heal their body, mind and spirit and assist them to achieve their goals. Head over to the ‘Brain Gym’ page for more information. I will continue to discuss and share information on nutrition and digestive health but will also be including information on Brain Gym®, brain and body functioning… Encompassing whole body well-being! A few months ago one of my lovely friend introduced me to the world of DoTerra Essential Oils. The oils were the product I had been searching for since having Finlay. Whenever he was unwell with a snuffly nose, teething or had a temperature, my husbands first response was always “Do you want me to go to the chemist and get some…” Which was my husband only wanting to do what he thought was the best for Finlay. However, I would wait until absolutely necessary to give him the medicine because I just didn’t feel it was the ‘right’ thing to do (my version of wanting to do the best for Finlay too). Now I have this amazing resource of oils that not only help with fixing ailments but work as a preventative measure as well, which has been very empowering. My main priority has been for healing & wellness for Finlay. For example, there is an oil blend called Digestzen which has been extremely beneficial for improving his digestive system. The oils can replace beauty products, medicines and chemicals for cleaning in your home. Overall this is going to help everyone’s health and well being with less toxins getting in our bodies! DoTerra oils are ‘pure, potent and effective’. The quality of DoTerra oils means they can be used aromatically and topically but they can also be used internally. Every morning I start the day with a large glass of water with a drop of lemon oil 😋 I’ve made my own tooth paste which Finlay can also use without me worrying about the chemicals 😁 The uses for the oils are endless. Ensure you are using the right amount of oil and use a carrier oil where necessary (dilutes the oil and also helps absorption) this is especially important when using the oils with your children or if you are pregnant. Our top three game changers have been chicken broth, fermented veggies and ghee. Game changers because of the health benefits we received from including them in our diet and also for their tastiness! Today I’m talking about fermented veggies. Information and recipes are from Sally Fallons ‘Nourishing traditions’. The process of fermented vegetables and fruits, has been around forever. It is how our ancestors preserved foods to have them available all year round without the use of freezers or canning machines. Lactobacilli (lactic acid producing bacteria) are found on the surface of all living things, especially on leaves and roots of plants growing near the ground. Through preserving / fermenting, lactobacilli multiplies. This enhances digestibility and increases vitamin levels, enzymes, antibiotic and anti-carcinogenic substances. If you are taking a probiotic that is great but the added bonus of fermented vegetables is that they travel further down the digestive system (unlike the powder substance of a probiotic which is absorbed earlier in the digestive tract). So I hope I have convinced you to give fermented veggies a try! Fermented veggies are great to add to your plate when eating meat (to aid in digestion of the meat). Do not heat fermented veggies otherwise it will destroy all the good bacteria. 4 tablespoons of whey (or additional tablespoon of sea salt). Add all ingredients to a bowl, mix and then pound with a wooden pounder for 10 minutes to release the juices. I have found adding the cabbage straight into the mason jar a bit at a time and then pounding makes it easier, again you just add more cabbage when the juices start to be released. Cover tightly. 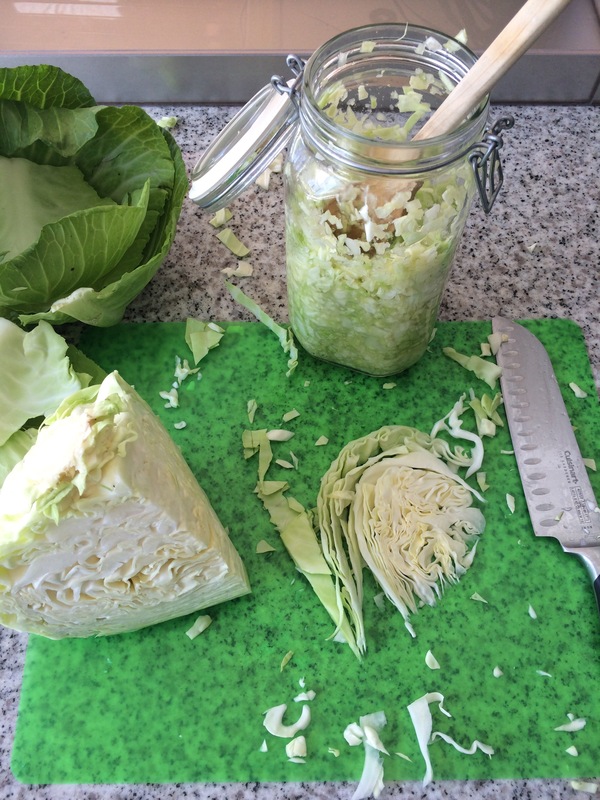 If there is room in the jar the air will turn the top part brown so I usually stuff the top with the outer leaves of the cabbage so there is as little air as possible. Then you can leave it on the bench for 3 days (or longer during winter). Gas can build up in the process so once or twice open the top to let the gas out, before transferring it into the fridge. Peel and cut beets into julienne strips or use the cheese slicer on a grater, (do not grate the beets though as this releases too much juice and will produce alcohol rather than lactic acid). Place beets in mason jar and push down slightly with wooden pounder. Combine remaining ingredients and pour over beets. The top of the beets should be at least 1 inch below the top of the jar. Cover tightly, leave on the bench for 3 days (or longer in winter) before transferring to the fridge. (Above picture includes grated carrot as an extra). 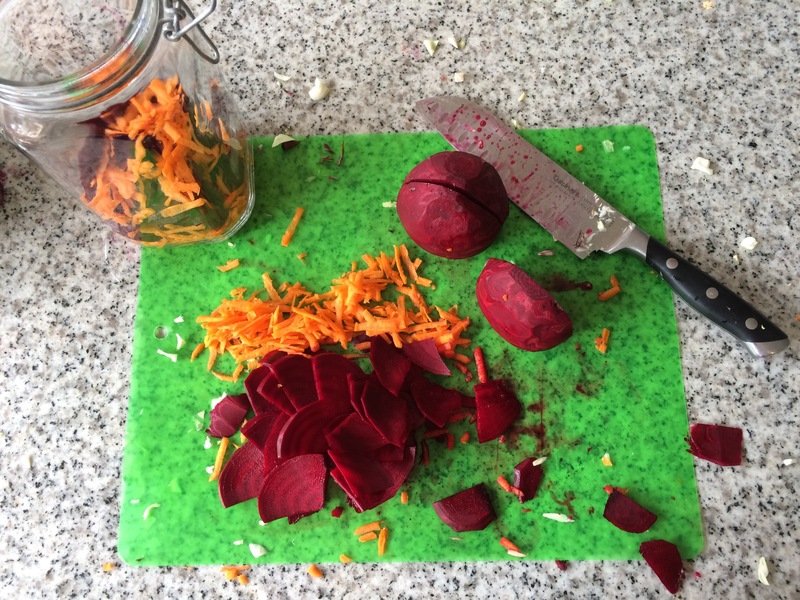 Both of these recipes require practise (did for me anyway)… The beets can produce a scum on the top, I scoop this out or wipe with paper towel daily. Generally ferments are pretty hardy and forgiving. That being said, I do stick to these easy, safe options but there are so many other varieties out there. So if you are more adventurous with your ferments and try something that works well, please let me know!! Your body needs a balance of good and bad bacteria to function optimally. If there is too much bad bacteria, illness and disease can set in. We are all walking ecosystems made up of microbiomes (small communities on microbes), collections of good and bad bacteria all over our body. If you could remove all of the bacteria in one person’s digestive system, the whole lot would probably weigh about 1 kg. The small intestine is where most digestion and nutrient absorption takes place. A balance of good and bad bacteria is required to help this function. Due to alcohol, highly processed foods, antibiotics and other medications or toxins, good bacteria can be replaced with bad bacteria. Bad bacteria over growth can spread from the large intestine up to the small intestine causing symptoms of IBS as the bacteria responds differently to different foods for example starchy / non starchy foods. This is called SIBO – Small Intestinal Bacteria Overgrowth. With the assistance of a naturopath, Finlay and I followed the FODMAP diet in order to have our systems rebalanced. We both had the addition of some supplements / natural remedies, as well as the correct selection of probiotics. There are many strains of probiotics out there and it is important that the right one is used for these circumstances. So what is the FODMAP diet? FODMAP stands for Fermentable, Oligosaccharides, Disaccharides, Monosaccharides and Polyols, these are molecules found in the food we eat. These molecules can be poorly absorbed by some people. For example some foods can cause water retention – slowing things down in the digestive system. Then other foods can cause the water to be drawn out and expelled – speeding things up. These symptoms are similar to that of Irritable Bowel Syndrome (IBS) which is why the FODMAPs diet is also used to treat IBS. There is an initial stage of six weeks where the diet is quite strict, followed by another six weeks with more additions to the diet and increased amounts of the ‘allowed’ vegetables. Following the diet meant another major shift to our diet, taking out foods that are high in FODMAPs. There was a limit or total ban on vegetables that I had become confident in cooking, like cauliflower, onions, peas (Finlays most favourite food in the world at the time) and pumpkin (my favourite). I had to learn about preparing, cooking and including vegetables like bok choy, silver beet and radishes into our diets?!?! On a positive, I now have a much wider range of variety and a healthy balance of different vegetables as well as other foods. After the diet was finished we continued with the natural remedies and probiotics. I could honestly say and feel that we were clearing through the path of healing. It is such a good feeling when you know that your body is working as it should be! I had a couple of requests for a bone broth recipe, so here’s what I use. I do this weekly so try to keep it as easy as possible. Put all the ingredients (except parsley) in a large pot and fill with filtered water. Bring to a slow boil and then reduce to lowest temperature. ‘Scum’ will rise to the top, scoop this out. Then it’s all good to be left over night (can do it for up to 24 hours if you wish). In the morning add the parsley 10 minutes before turning it off. Once cooled pour and store into large glass jars with a decent seal so broth stays fresh for the week. I’ve broken so many glass jars because I don’t wait for it to cool enough! A layer of fat will develop on the top when refrigerated, it is okay to include this when reheating (wouldn’t recommend it if you don’t use free range chicken though as the toxins are stored in the fat). Note: You can be flexible with the types and amounts of vegetables and herbs you use, these amounts seem to be the best flavour for us. You can also use a whole chicken instead and then pick the meat off for an easy meal. The biggest improvement in my sons digestive health came from doing the GAPS diet and adding chicken bone broth regularly to our daily routine. After reading a valuable book ‘Nourishing Your Child for Health and Happiness’ by Sally Gray, a Naturopath (amongst other qualifications) and discovering she lives here in WA, I made an appointment to see her. The GAPS diet had starting popping up on my radar and this is what Sally recommended for Finlay and I. GAPS stands for Gut and Psychology Syndrome, it is a diet created by Dr Natasha Campbell-McBride. GAPS works on an understanding that there is a link between the digestive system, the brain and immune system. Relieve the body of an excess toxic load. All meals required cooking and there was a lot of preparation, 2 things I was only just learning to do! It required the most work but we got the best results from it. Over the time we were able to introduce a lot of foods that were previously not tolerated. This saw Finlay eating all fruits and vegetables, all meats, seeds, nuts, eggs and occasional cheese or yoghurt. The only foods we were totally excluding after doing GAPS were grains and white potatoes (as this is recommended). I would highly recommend the diet and we have done it again since the first time we did it. A note on healing: If you imagine a large meal that is raw, has grains (especially gluten loaded), dairy or full of toxins, the body has to spend all its energy breaking that meal down. If there are any parts of the body that need healing, the body is not able to work on repairing itself (which is what it is designed to do). Yes, I mentioned raw just then, which you may be thinking is a good thing. I am definitely an advocate for raw foods as cooking at high temperatures especially in water, destroys some of the vital nutrients and minerals. However, through the process of cooking, fibre is reduced and makes it much easier for the body to digest. GAPS isn’t all about cooked foods but for the introductory phase it certainly is and this short term ‘break’ on your body certainly has its advantages for repairing. This same theory can be applied to pregnancy, labour and the weeks after child birth. The body needs to be able to focus its energy on making a baby, preparing the body and repairing the body, not to mention the energy demands of breastfeeding. If you are loading your body with foods and beverages that are harder for the body to digest it takes energy away from the baby. As I’m heading into the final weeks of my pregnancy and preparing for the massive job of labour and breastfeeding, I’m avoiding unnecessary toxins, sugars, gluten and dairy (apart from butter and occasional cheese) all to make this process easier on my body.